Classic wood runabouts are abundant at shows like the Les Cheneaux Antique Wooden Boat Show and Festival of Arts, which is hosted in Hessel annually and this year runs Aug. 9-11. 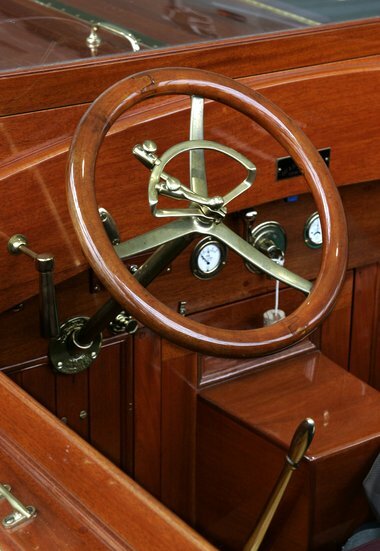 Pictured is a brass and wooden steering wheel with instruments on the dashboard in the May LaFever, built in 1912 by Fay and Bowen. Photo: Rex Larsen, MLive. Michigan’s wood boat building history comes to life every summer in Great Lakes shoreline communities. It’s a time when quaint harbor towns celebrate the state’s boating heritage with wooden boat shows that showcase the gleaming varnish finishes of Michigan-made and other classics. If you like antique wooden boats, consider checking one out. The shows are a perfect stop during any planned Michigan vacation, a day of fun and festivity. “It’s a happening. People love to see them come in from the islands or watch them getting launched,” said Barb Smith, co-chair for the 36th Annual Les Cheneaux Islands Antique Wooden Boat Show and Festival of Arts on August 10. The show is held in the eastern Upper Peninsula town of Hessel. The Hessel show is Michigan’s largest wooden boat show with 130 or more boats on display, most of which float at docks that can be toured. The show is sponsored by the Les Cheneaux Historical Association. More shows listed below. See calendar. Many of the vessels were built in a bygone era by Michigan companies like Chris Craft, The Hacker Boat Company, Garwood Industries, and the Century Boat Company. Look also for the occasional wood sailboat and live-aboard, 1950’s cruiser. Trumpys were built in the 1940’s in Annapolis Md. The company catered to an elite clientele. Its 104-foot “Sequoia” became the presidential yacht for FDR, Truman, Eisenhower, Kennedy, Johnson and Nixon. being added. The 2012 show featured “My Darling,” a 1949 vintage, 31-foot Hacker design hydroplane. Smith expects to see a number of entries this year. The Les Cheneaux gathering is one not to miss, but it is one of a dozen shows scheduled this summer on the sunrise and sunset sides of the state. Another popular show is Classic Boats on the Boardwalk in Traverse City, now in its 26th year. More than 70 restored classics will be on display along the Boardman River on Aug. 3. The event is sponsored by the Water Wonderland Chapter of the Antique and Classic Boat Society. South Haven is home to another unique wood boat gathering, one focusing on human-powered watercraft or sail. The 32nd Annual Classic Boat Show and Small Craft Festival is held at the Michigan Maritime Museum. The June 22 show highlights 40 to 50 vessels. It is sponsored by the Traditional Small Craft Association, in conjunction with the museum. Another special attraction is an authentic whaleboat now being built by the Great Lakes Boat Building School in Cedarville for the Mystic Seaport Museum in Connecticut. The school was commissioned to build one of seven whaleboats expected to accompany the Charles W. Morgan when it puts out to sea later this summer. The 133-foot-long Morgan is the last of the wooden whaleships. It was built in 1841 and is being restored by the Mystic museum. Michigan wood boat building history has another important showcase in the town of Algonac on the St. Clair River, the former birthplace for many boats on display this season. ChrisCraft and Garwood Industries both built boats there. And the town has become the home of the “Where It All Began Michigan Chapter Antique & Classic Boat Show” put on by the Michigan Chapter of ACBS. The show’s “Marque Boat” this year is the wooden cruiser. Between 10 and 20 antique cruisers will be on display, according to Garmhaus. The show venue, however, has been moved from Algonac to St. Clair this year due to low water levels. This summer’s wood boat show calendar has a lot to offer boating buffs. If you plan to be in that part of the state, take time to visit one or more. Some of Michigan’s best kept secrets will be on display for all to enjoy. June 1: Eighth annual Spring Lake Wooden Boat Show, Mill Point Park, 9 a.m. to 3 p.m., Spring Lake. See: springlakevillage.org. July 12-13: South Arm Classic Festival, East Jordan, Classic boats and cars. See: southarmclassicboats.com. Aug. 3: 26th annual Classic Boats on the Boardwalk, 10 a.m. to 4 p.m., Traverse City, Contact Deb Parker, 616-249-0529, dlparker2@comcast.net. 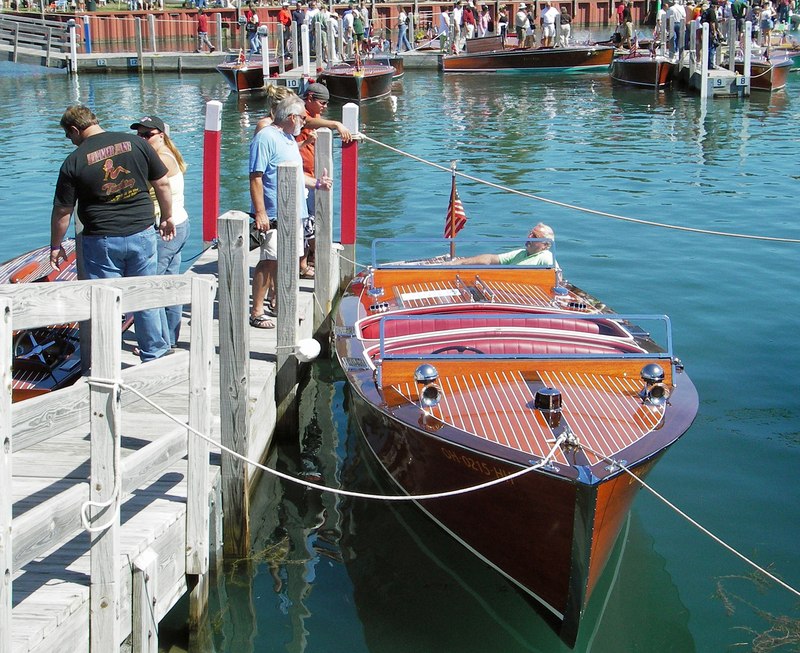 Aug. 10-11: Port Sanilac Antique and Classic Boat Show. See: michacbs.com/events/shows. Aug 25: Eighth annual Vintage Holland Boat Show, 10 a.m. to 4 p.m. Holland Museum, Holland, 31 W. 10th St.
Sept. 7: Blue Water Antique and Classic Boat Show, 10 a.m. to 4 p.m., Port Huron. See: bwacbs.org. Sept. 13-15: Century Boat Club Thoroughbred Roundup, Manistee. See: centuryboatclub.com. This feature appears on MLive Outdoors. This entry was posted in Uncategorized and tagged Artisans, Boat building, Boating, Boats, Century, Charles W. Morgan, Chris Craft, Great Lakes, Hacker, Michigan Maritime Museum, Mystic Seaport Museum, Wood Boats, Woodcraft. Bookmark the permalink. I attended the annual show in Gibraltar last summer. My Grandfater used to work for Chris Craft back in the 40’s so it’s always cool to see the boats from that time frame. I’m sure he worked on some of them. Love it! we hope to be at every one!